Recipes are still coming in for the Book Chook Cook Book, so we've extended the deadline. 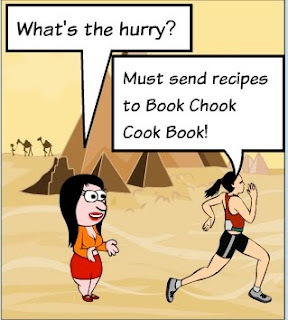 Please send to Susan (sueles at bigpond dot net dot au) your easy recipes that are quick to prepare, thus giving us more time for what we'd rather be doing - reading, writing and creating! Please send to Tif (tiftalksbooks at gmail dot com) your recipes that are great to cook with kids. For more information about the project, read this post. Thanks, Kylie, I'll do that as soon as I have a post that fits your criteria!